Lately it seems like tan suede ankle booties are taking the streets one pair of feet at a time. Granted, they're one of those classics that remains on trend, but I feel like I've been seeing more and more of them. Usually, I refrain from buying the "it" piece that everyone is wearing, but I'm an ankle booties fanatic, and it's a shade that I'm missing in my collection which makes wanting one even more sensible to me. Now, the challenge is to just pick one pair...I love their versatility ranking them high on my fashion must-haves item list. Think about it, instead of wearing the typical black shoes, what a nice change it would be to pair one of these with jeans, or even with an adorable pleated chiffon (similar to here and here) or lace skirt, and/or on cold months they can also be paired with black tights. What I like most, are the heels. They have a much lower stacked heel that are much more practical and comfortable than most of my other shoes that I usually wear to run errands in when out shopping either for me or clients. By the way, I did make a decision and purchased one. Which one do you think I snagged? Let me know by commenting in the comment box below. 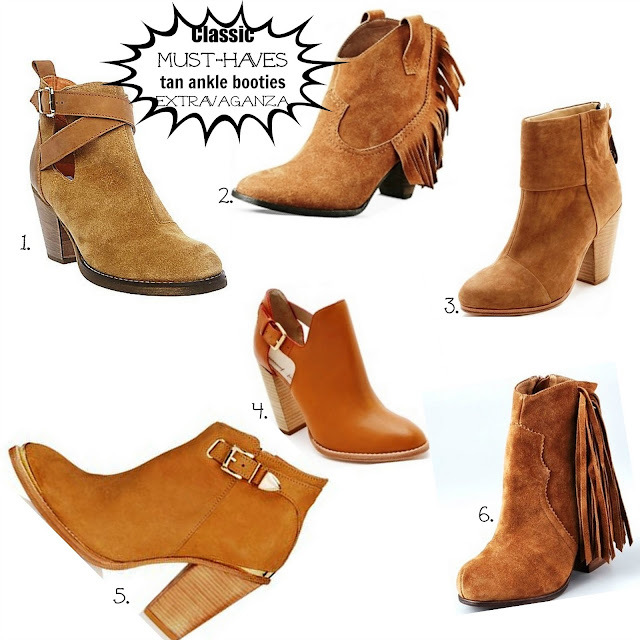 * Izie Fringe Booties... talk about attention getter! * A true tonal stud... ranking very high on my wish list for sure!